Arts, AV Technology, and Communications careers encompass designing, producing, exhibiting, performing, writing, and publishing multimedia content including visual and performing arts and design, journalism, and entertainment services. Time Management Managing one’s own time and the time of others. Coordination Adjusting actions in relation to others’ actions. Artistic Artistic occupations frequently involve working with forms, designs and patterns. They often require self-expression and the work can be done without following a clear set of rules. and non-traditional students for any year in college or technical school. (Part-time and full-time enrollment available) Applicants must reside in Jefferson, Lewis or St. Lawrence counties – applicants may re-apply each year. Application packets are available in February each year, and can be downloaded at that time as a PDF (requires Adobe Acrobat Reader ). Application packets will also be available through high school guidance counselors or at the Community Foundation office. Completed packets must be returned to the Foundation by April 1, by mail or hand delivered. They may not be submitted by e-mail. A complete listing of all scholarships offered by the Foundation is available here. Applications can be found here. 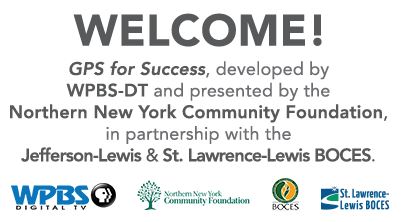 Applications are to be submitted to the NNYCF office as a packet. Please refer to the cover page of the application for "packet" requirements. Many occupations in this cluster typically require a bachelor’s degree, although specific designations vary. For example, public address system announcers typically need a high school diploma or equivalent and short-term on-the-job training, and art directors typically need a bachelor’s degree and 5 or more years of experience in a related occupation. Can’t find what you’re looking for? Search colleges by location and interest here. 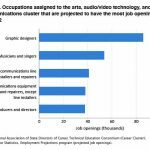 According to the Bureau of Labor Statistics, there were about 1.8 million jobs in the occupations that are assigned to the arts, audio/video technology, and communications cluster. Median annual wages for these occupations ranged from $24,220 for floral designers to $83,000 for art directors. 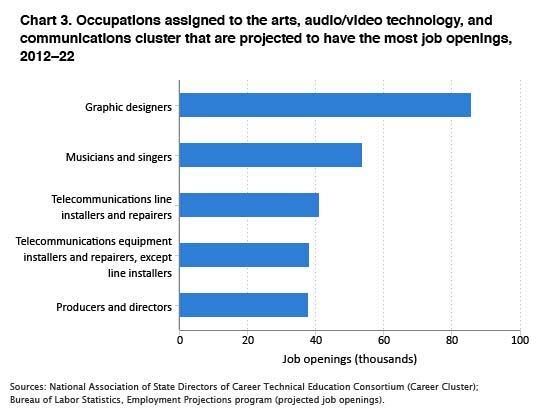 BLS projects most job openings in the arts, audio/video technology, and communications cluster to be in occupations assigned to the visual arts pathway, which includes graphic designers. This occupation is projected to have the most job openings in the cluster.